Daniel MacIvor as Dougie (left) and Andrew Moodie as Allen (right) are two soldiers that fought a dark war together in Tarragon Theatre’s exhilarating presentation of New Magic Valley Fun Town. The highly memorable show runs until March 31, 2019. The filter that playwriting national asset Daniel MacIvor uses to explain the world around him is forever unique if not downright peculiar. Aside from his monumental solo works of years gone by, the Governor General’s Literary Award winner that who has given us Marion Bridge, You Are Here, and A Beautiful View—among others—choses never to leave a story map that doesn’t have long bends and unsuspecting dips in the road. Cape Breton’s theatrical magic maker’s latest offering New Magic Valley Fun Town does not buck this trend. In this reunion event setting packed with an undeniable 80’s feel thanks to songs by Supertramp, Paul Simon and The Clash, not all Tim Horton’s are the same, Facebook is all lies and some people running should not be confused with the title runner. What starts off as a small town soap opera, a non-sophisticated domestic comedy or sorts gives way to a dramatic drilldown of survival while underscoring the importance of standing up to tell the truth. ‘We all got our damage,’ assures Allen who serves as a mystic figure for a significant portion of the play until video files of the past surface and cuts deep into old emotional wounds. 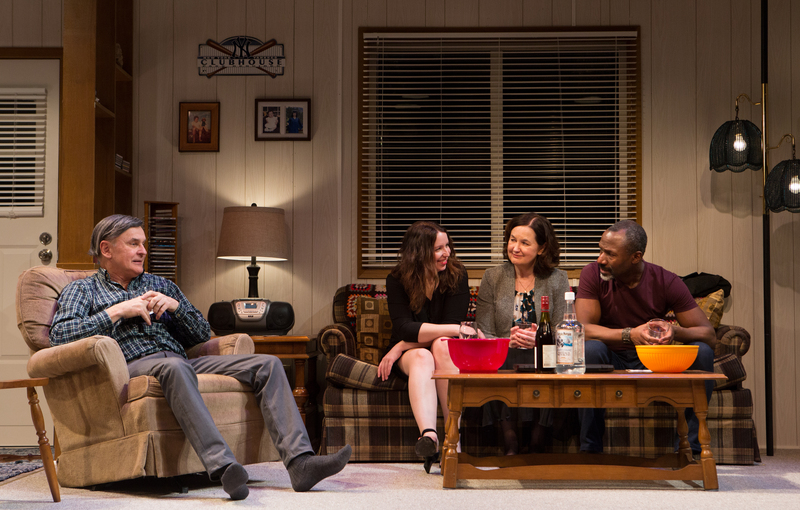 Never does the silliness exhaust itself but instead the play pulls its audience toward an impossible reconciliatory conclusion.